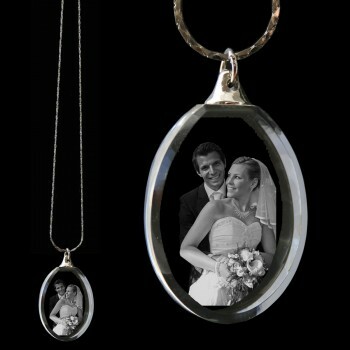 Laserpics crystal pendant necklaces can be personalised by engraving their centres with pictures of loved ones. This is achieved through Laserpics’ skilful laser engraving service. I was not happy with the way my pendant originally turned out. They graciously worked with me, and I am now a very satisfied customer. The necklace is just beautiful. Thanks so much! just recieved the oval pendant i had ordered and can i just say im delighted with it as its a gift for my daughter infact i am ordering more soon as it is stunning and good value for money fast delivery also going to buy other items for other family members. As this was a very personal gift with special meaning I can't say how pleased I am with the result, absolutely delighted and would not hesitate to place an order in future. Thank you so much.